“The NMAA is preparing for the annual Congreso de las Acequias as we celebrate another growing season and the bountiful late summer rains. The Congreso is the only statewide gathering of acequia leaders where we share knowledge and create strategies for protecting our precious acequias and the water that flows through them. Our theme this year is Nuestra Agua, Nuestro Futuro: Acequias Rising. Please join us as we celebrate our traditions, make plans for our collective future, and work together to keep acequias flowing and our communities strong! 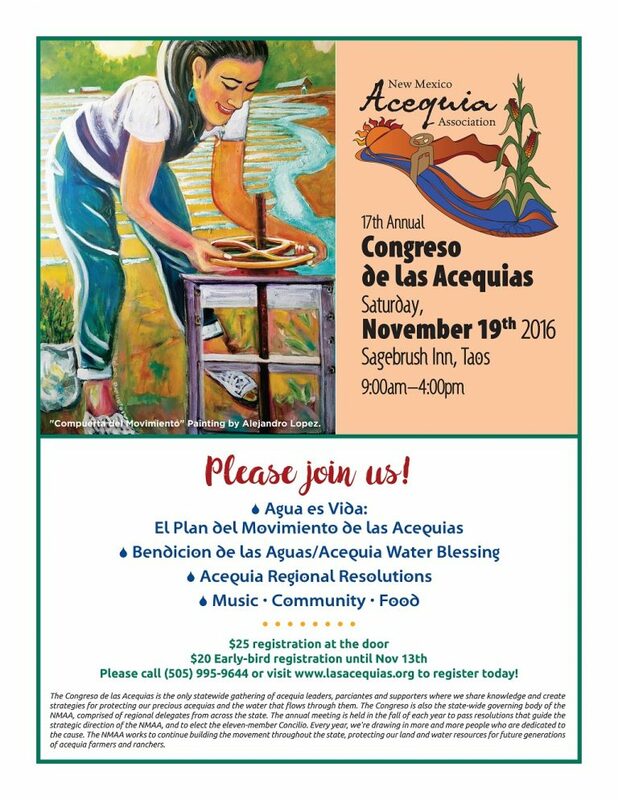 This year, the Congreso de las Acequias will take place on Saturday, November 19th at the Sagebrush Inn and Suites in Taos, NM from 9:00am to 5:00pm. $25 registration fee at the door, or take advantage of our Early-bird registration rate and pay $20 until Nov 14th! Click here to register online for the Congreso de las Acequias!